We were asked to display our vehicles at the Veterans Park on Saturday and we had 4 vehicles on display. Greg Hoopes, Kendall and Weston Lundy, Jason Smith, Loren Anthony, and members Judy and Gary Cross and Dave Shultz. What a great Memorial park. There was a groundbreaking for the American Revolution monument and a dedication made for a WWII monument. 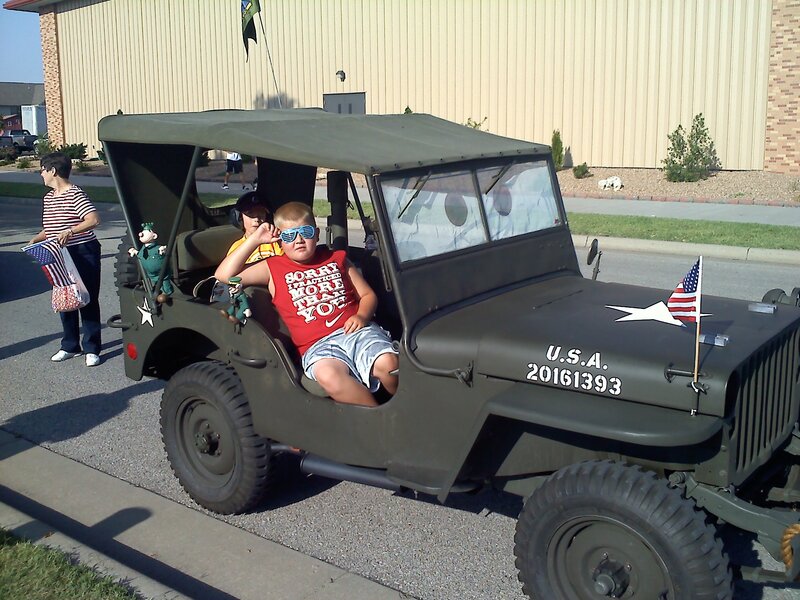 My grandsons and I drove my jeep in Haysville’s July 4 parade. I made a set of eyes to resemble Sarge from the movie “Cars”. The kids really liked it. It was hot, but fun. We had a great time on the Fourth in Eureka. Family gathering, eating, and then the parade. Thanks to Jason and family, Judy and Gary, David Cross (birthday boy), and David Shultz, for bringing their vehicles to share.